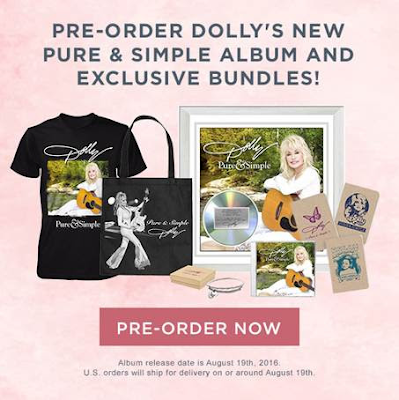 Lovin' Lyrics Music Promotions: DOLLY PARTON ANNOUNCES ALBUM PRE-ORDER BUNDLES AND RELEASES LYRIC VIDEO FOR "PURE & SIMPLE"
Standard Bundle ($40) - Pure & Simple album cover art on black 100% preshrunk cotton t-shirt, Pure & Simple CD, as well as an album digital download (will be delivered via email on August 19th). 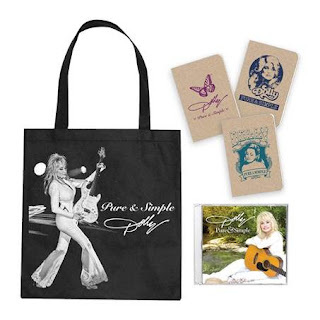 Deluxe Bundle ($60) - Pure & Simple CD, as well as digital download of the album (will be delivered via email on August 19th), a 3 notebook set with different Dolly logo designs (each notebook measures 3.5" x 5.5"), and a Rhinestone and lace Dolly photo tote bag. 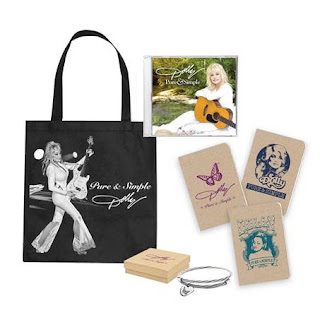 Collectible Bundle ($100) - Pure & Simple CD, as well as a digital download of the album (will be delivered via email on August 19th), a collectible Dolly guitar string bracelet and custom gift box, a 3 notebook set with different Dolly logo designs (each notebook measures 3.5" x 5.5"), and a Rhinestone and lace Dolly photo tote bag. 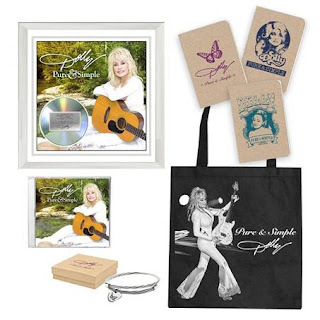 Commemorative Bundle ($400) - Pure & Simple CD, as well as a digital download of the album (will be delivered via email on August 19th), a collectible Dolly guitar string bracelet and custom Dolly logo gift box, a 3 notebook set with different Dolly logo designs (each notebook measures 3.5" x 5.5"), and a Rhinestone and lace Dolly photo tote bag, and a 16" x 16" Collectible Limited Edition plaque commemorating the release of Dolly's new album Pure & Simple (each plaque has the cover art and an official certificate of authenticity plate inside).